Chances are if you‘re like me it was at a driving range. What a fantastic place! Where else can you go and let our your frustrations by swinging a club at a ball and driving it 200 yards downrange and have a ton of fun at the same time? That‘s what getting started with golf was like for me. I went to the driving range two to three times a week and spent hours just having fun. I wasn‘t thinking about what club I was using what the best approach to the green would be or trying to read the green to make birdie with one putt. It sure wasn‘t just taking a whack anymore. Now it was about strategy and scores. Now it was about choosing which number club to use. What approach do I take in reading my next putt? I love golf but it was more like operating a business than spending time playing my favorite sport. Decisions strategies trying to think two strokes ahead.... it was work. I wasn‘t relaxed. I didn‘t feel refreshed after each round. I even started struggling with my scores. Instead of making par or under most of the time I started finishing with ten to fifteen strokes over. But then I started learning a few things. I started to learn how to get back my joy and lose those extra strokes off my game. With a few very simple techniques that you can do without trying to learn a whole new swing you too can learn how to get back to having a lot more fun and lose several strokes off your game. It won‘t cost you any extra money. You won‘t need any private lessons. You can do this with pretty much the same skill you have now. I say that pretty much for the simple fact that as you practice and play more your skill level will increase anyway. 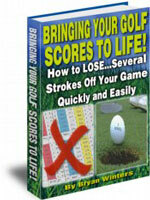 Bringing Your Golf Scores To Life! is delivered in PDF format and is viewable on any computer. All you need is "Adobe Reader" or "Acrobat eBook Reader" which is available free and already on most computers. If you do not have it installed on your computer Please Click here to get the software. They are both Free.